This dock stretches serenely off Myrtle Island near Bluffton. It leads to the May River, a body of water which has contributed greatly to the area’s history and continued success. Bluffton is named for its high bluff that overlooks the May River. Founded in the early 1800s, it became a popular place for plantation owners and their families to escape the sweltering summer heat. Located in Beaufort County, Bluffton quickly became a popular coastal distribution center. Its proximity to both Beaufort and Savannah allowed local farmers to ship their crops far and wide. 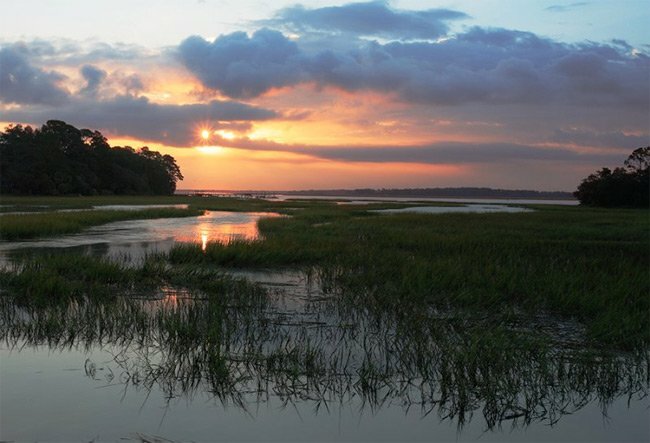 Visitors and residents of Bluffton enjoy beautiful marsh views and historic antebellum homes. The town also has a popular downtown area with many shops and restaurants. Small world, I live in Bluffton and been to this spot many times. Absolutely beautiful.